There are 3 different sizes of arm available. If you are unsure, please call us before placing your order so we can make sure you choose the right one. These accessories are for Primrose Awnings only, we cannot guarantee they will fit or work with any other awnings. 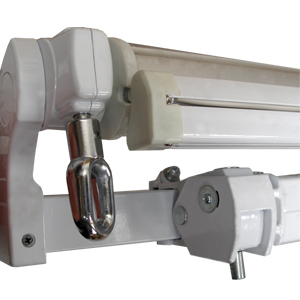 The arms for the standard awning have an alignment adjuster where the arm attaches to the back bar (below). If your awning doesn't have this adjuster, you have an earlier model of standard awning - please let us know and we'll supply the earlier arm. "received goods within hours, good service"
"product was as expected, tho we would have appreciated some fitting instructions."